You know we all practice in a special place when you can run in shorts and a t-shirt and two days later be shoveling a few inches of snow. With the warmer weather comes an important annual event in the state. Known as “Doctor Day” we all have an opportunity to don a white coat and engage in face to face conversation with those individuals whose decisions affect not only our practice, but the lives and wellness of our patients. This year is particularly impactful for us as emergency physicians as we have many issues important to our specialty that need legislative support. For those of you who have participated in the past, thank you. If you’ve never attended a Doctor Day and can find some time to get away on May 1st I’m certain it would be worth your effort. WACEP will be hosting a private policy primer update beforehand to prepare all of you on the key issues. The Doctor Day agenda itself promises to be high yield. We have Wisconsin’s governor Tony Evers slated to speak and the topics that will be front and center for the day include Medicaid access and the historically low reimbursement rates in Wisconsin, as well as the extremely hot topic of childhood vaccination and personal conviction exemptions. I’m nearly certain all of you have an opinion on that topic. The day wraps up with time for you and other providers to talk with legislatures, and finishes with a reception close by at Madison’s on King. For more details and the link to register please visit https://www.widoctorday.org. Starting in 2021, if an ordering physician does not demonstrate through an EHR Clinical Decision Support tool (CDS) that they have consulted the AUC for the study your ordering, CMS will not reimburse the professional or technical charges for the study. To clarify, you have to review the AUC, but not necessarily adhere to them. Emergency physicians will find it to be important because CMS also gives radiologists the green light to refuse to do the studies for which appropriateness criteria were not reviewed. This system is already in place in the ambulatory care setting. It will be implemented in the emergency department in less than a year, on Jan 1 2020, but the first year is for "education and operations" and no claims will be denied. As patterns amongst insurers normally happen, we can certainly expect commercial insurers to follow suit soon thereafter. This follows a trend happening for having higher standards for "indications" for studies we order, as already evidenced by our dropdown boxes, etc when you order any image. How this will work in practice for testing from the ED is unclear. These criteria do not apply for patients that have an Emergent Medical Condition as defined by EMTALA. However, this is a rather high bar that arguably some of our patients do not meet, and we all know the reputations of payors for determining if care was "emergent" based on final diagnosis rather than presenting symptoms. The regulations released from CMS specifically name EDs as being a place of service where these AUC apply. Given the above somewhat conflicting information, our hospitals will likely roll this out for all CTs, V/Qs, and MRIs that are ordered from the ED, not excluding patient care that we determine in the moment to be for someone having a true Emergent Medical Condition. What will this actually look like in real practice? It would be reasonable to expect a more extensive clicking process as you enter the order rather than just choosing the indication in a drop down. In order to minimize impact on workflow, ideally it would just be a modified drop down to choose the most applicable (predetermined to be appropriate) criteria, with an additional option to demonstrate that you have reviewed the criteria and feel it appropriate to deviate from them. Hospitals will have to invest in CDS as an adjunct to the EHR, or the existing EHR will have to be updated to meet this need. Reviewing a couple specific examples of “appropriateness” scores helps to clarify what a future rollout in our workflow may look like. Take a look at the table from ACR grading various studies looking for aortic dissection. Graded on evidence for utility and radiation exposure. Doing a PET scan, for example, would be considered "usually not appropriate" but MRA/CT/echo would all be considered "usually appropriate." Prevent this from creeping to other imaging study orders such as X-rays, ultrasounds, etc. Make sure that whatever EHR adaptations are done are sensical and workable. ACEP recommends the CDS created by the ACR, called "ACR Select." We should not be expected to access an external web portal for our CDS, which also exist. If the workflow is clunky, we need to have a process in place to bypass choosing criteria for studies that must be done immediately for critically ill patients. The Wisconsin Medical Society House of Delegates met on Sunday, April 7, 2019. Several Emergency physicians participated in the annual policy-making function of the society. Three resolutions introduced and sponsored by WACEP were discussed and accepted as policy. The first resolution, Assessing Medical Stability of Patients with Acute Mental Health Needs in the Emergency Department, seeks to form consensus principles on the utility of the Emergency department to provide medical clearance and hopefully expedite the process to make it more patient-centered. The second resolution, Addressing Mental Health Treatment Barriers Created by the Medicaid IMD Exclusion, asks the Society to provide information on the exclusion to interested membership and support a Medicaid waiver demonstration application that seeks to receive federal financial participation for Institutions for Mental Diseases services provided to Medicaid beneficiaries. The IMD exclusion is a decades-old law that was intended to pass the cost of mental health treatment to the states. It prevents federal Medicaid dollars from be utilized for certain inpatient psychiatric care. This exclusion has contributed to the challenges of financing, and therefore placement of inpatient psychiatric care for the Medicaid population. The final resolution seeks to revise the Wisconsin Psychiatric Bed Locator. This portal is meant to provide up-to-date information on psychiatric bed availability; however the information available is not always up-to-date or accurate, and the system has not been utilized by most emergency departments. This resolution brings together psychiatrist and emergency physicians to help improve effectiveness of the application. Lastly, the WMS Board presented an informational report outlining a proposed revision of the organization’s Constitution and Bylaws, whereby the policy-making body of the Society would transfer from the House of Delegates model to the Board of Directors. It was reported that several other states have successfully transitioned to this governance model. The new process would seek input from members throughout the year, rather than once per year as is done under the current model, and would provide a significant cost-savings to the organization. The proposal will be discussed and potentially voted on at the 2020 House of Delegate meeting next April. If you have any interest in collaborating on behalf of emergency physicians at the Wisconsin Medical Society or beyond, or if you’d like further information on the items of business discussed at this year’s House of Delegates, please feel free to contact me. On March 21, WACEP Delegation Chair, Dr. Bill Falco, met with Congressman Bryan Steil, who represents the 1st District of Wisconsin in the U.S. House of Representatives. The meeting was coordinated as part of an aggressive push by ACEP for members of ACEP's 911 Network to meet with many of the nearly 100 new members who were sworn in to the 116th Congress on January 3rd. 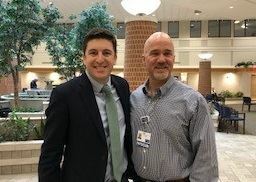 During the meting, Dr. Falco had an opportunity to introduce Rep. Steil to ACEP and to share pertinent information on the specialty of emergency medicine and its role in the health care delivery system. Dr. Falco successfully established himself as a local contact in the health care space, as evident by the invitation he received to serve on Rep. Steil's healthcare advisory panel. With federal lawmakers actively working on legislation to address the surprise billing/out-of-network payment issue that is expected to move in the Senate by June, ACEP member advocacy at the 2019 Leadership and Advocacy Conference could be hugely consequential for the future of emergency medicine. Visits to the Hill to advocate on critical issues like this do make a difference. Click here to see how advocacy from ACEP members at LAC last year directly led to big wins for ACEP and emergency medicine. In addition to making these critical Hill visits, LAC attendees will hear from policymakers and experts about the latest developments on public policy issues that directly impact their practice. The conference will also include an afternoon dedicated to effective chapter leadership and a solutions forum highlighting innovative approaches to reduce boarding of psychiatric patients and successful uses of telemedicine. Two post conference events are also available: MAT Waiver Training and an Acute Pain Management Bootcamp. To learn more and register to attend LAC, go to www.acep.org/lac. In November, Wisconsin elected Democrat Tony Evers as its 46th Governor, and simultaneously returned large Republican majorities to both the State Assembly and State Senate. This ended nearly a decade of total Republican control of Wisconsin state politics, and gave Wisconsin split control of state politics for the first time in more than a decade. Accept Federal Medicaid Expansion, anticipated to provide coverage of an additional 20,000 Wisconsin residents, and bring in $320 million in additional Federal funds over the biennium. “Provide” $365 million for payments to “institutions” (hospitals) providing care to MA patients (it is unclear how great an increase this represents overall). “Increase” incentive payments for Dentists by $38.5 million. “Provide” $69 million for MA non-institutional (physicians, other providers and clinics) Mental Health Payments (again, it is unclear how great an increase this represents overall). Provides funding for expanding reimbursement of “telehealth” beyond current “real-time communications” – to include sharing of data/info among providers, to specifically allow telephone/internet communications between provider/patient and among providers. Creates an “Admissions Medical Education Unit” at Winnebago, adding supervisory staff for evening and overnight shifts. Proposes legalizing “Medical Marijuana,” and decriminalizing possession of small amounts of marijuana for non-medical purposes. The Legislative majorities have already signaled their displeasure with Governor Evers’ proposals, especially his Medicaid expansion. While few of the Governor’s Budget provisions will survive the Legislature’s process as originally proposed, details on Republican plans are scarce. The Joint Finance Committee (JFC) will begin its work reviewing, debating and voting on the Governor’s budget proposals in April. Generally, JFC concludes its work and provides the Legislature with a revised Budget Bill in June, but with a Republican-controlled Legislature and Democrat Governor, it is widely anticipated the Budget process may last well into the Fall of 2019. Medical Student Road Trip to Ohio!?! The annual Midwest Medical Student Symposium is just over three weeks out, taking place on Saturday, April 13, 2019 at the Hilton Garden Inn Toledo in Perrysburg, Ohio. The event runs from 7:30 am to 3:15 pm with a Residency Fair taking place from 12:45 to 2:45 pm. Wisconsin's EM Residency Programs will be well represented along with many other programs from the Midwest. A $25 registration fee includes continental breakfast, lunch, workshops, EM Residency Fair, and Airway & Ultrasound Skills Labs. Gather a group of students together for a road trip to Ohio! Be sure to register first. Sign up today: www.ohacep.org/medicalstudents. Summer is only a few months away, and the Wisconsin Medical Society has teamed up with the Medical College of Wisconsin (MCW) and the University of Wisconsin School of Medicine and Public Health (UWSMPH) to make sure your health care team is prepared. From Asthma to Zika: A Physician's Guide to Summer is being held April 5-6 in Madison. Focusing on emerging health trends in infectious disease, environmental health and trauma, the new two-day education conference features a full lineup of speakers from MCW and UWSMPH, plus the opportunity to fulfill opioid education required by the Medical Examining Board and plenty of time to network with colleagues from across the state. Click here for details including session descriptions, speaker bios and registration information. The conference has been approved for AMA PRA Category 1 Credit™. Application for CME credit with the American Academy of Family Physicians is pending. In a vote of 240-190 earlier this week, the U.S. House of Representatives passed the ACEP-supported bill H.R.8 - The Bipartisan Background Checks Act of 2019. Under the nation's current federal law, licensed gun dealers are required to run a background check to make sure buyers don't have a criminal record or a history of mental illness, but law currently excludes private sellers/unlicensed dealers. H.R.8 would close this loophole. George Orwell’s 1984 really gave big brothers a bad rap. Sure, you can view the Healthcare Effectiveness Data and Information Set (HEDIS) as our government overlords squeezing the art (and fun) out of emergency medicine…but I tend to view their role as that of a real big brother. Big brothers can be overbearing, they smack us when we’re acting the fool, but they also keep us out of trouble and help us navigate tricky areas of our practice. Enter HEDIS measure “FUA”: Follow-Up After Emergency Department Visit for Alcohol and Other Drug Abuse or Dependence. ED visits for which the member received follow-up within 30 days of the ED visit (31 total days). ED visits for which the member received follow-up within 7 days of the ED visit (8 total days). The literature unequivocally shows that timely follow-up care for patients with OUD who were seen in the ED is associated with a reduction in substance use, future ED use, and hospital admissions. Unfortunately, the 2017 HEDIS data on FUA has just been released and only about 10% of adult OUD patients are getting follow-up care within a week of their ED visit and only 13% are getting that care within 30 days of their ED visit. We can do better and the solution is an ED to MAT care pathway. The arguments against starting an ED to MAT care pathway are abundant: its not the ED’s role, we can’t get started without PCP follow-up spots, the burden of getting a DEA X-waiver is unreasonable, my ED is going to turn into a buprenorphine clinic, etc, etc, etc. Step 1: Find two primary care physicians in your area who can reserve two Monday appointments and two Tuesday appointments for patients requesting MAT. Step 2: Ask patients to stop using their opioids 48 hours before their allotted appointment time and provide them with a starter prescription of clonidine 0.2mg BID (#10) and Zofran 4mg ODT prn (#10) to help stave off early withdrawal symptoms. Register for the WACEP Spring Symposium, where we break down the details of an ED to MAT care pathway at our hot topics roundtable. For an easy to follow protocol, check out this excellent resource that applies to both the ED and clinic setting. 2019 is going to be the year for ED to MAT care pathways in the Wisconsin. Your hospital administrators have likely already heard about the FUA HEDIS measure and (if it has not already) it will likely be showing up in your ED soon. We at WACEP urge you to stay ahead of the curve and start saving lives now: watch the webinar, print out the protocol, go to the conference, and get your X-waiver! Let’s make our big brother proud.